Rural farmers in many parts of the world are already using ‘smart’ agricultural practices like intercropping, agroforestry and rainwater harvesting. But what if those practices benefitted the livelihoods and landscapes of millions more? Climate-smart agriculture, the raft of sustainable agricultural practices designed to help farmers overcome hunger, adapt to climate change, manage their natural resources and curb rising temperatures, is a hot development theme worldwide. But its success will be measured not only in local benefits, but its ability to adapt and spread as resource demands grow and global challenges intensify. Scaling up climate-smart agriculture means replicating, spreading or adapting technologies and practices that secure more food on less land and in more sustainable ways. This is more complex than scaling up straightforward technological innovations, such as new grain varieties, because it requires much more profound change. 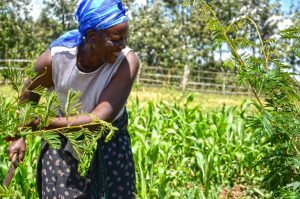 Integrating appropriate trees into complex agricultural systems, for example, involves training farmers, developing new supply chains, modifying current farming practices and then managing trees for competition with crops. According to the World Bank, those who live in rural areas – a staggering 70% of the world’s poor – will be most vulnerable to more variable and extreme weather. They often lack the governance, assets and technical capacity to innovate and adapt. Scaling up climate-smart agriculture takes not only the right practices, technologies or models, but the right conditions to make it happen, which may include incentives and insurance schemes for farmers, consumer demand and of course, the political will from their governments. Building on a series of workshops and eight of the latest climate-smart agriculture case studies from South Asia, a new World Agroforestry Centre working paper, Scaling up climate-smart agriculture: lessons learned from South Asia and pathways for success, identifies seven key ‘ingredients’ and several pathways for successfully scaling up climate-smart agriculture.